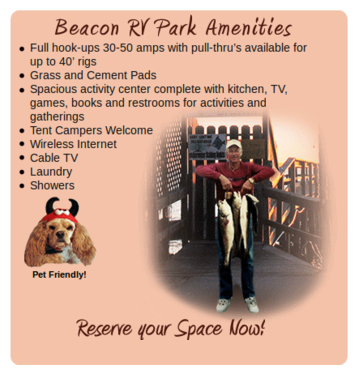 Welcome to Beacon RV Park, EZ Livin RV Park (Beacon #2) and Seascapes Cottages! At Beacon RV Park in Rockport, TX, beautiful Aransas Bay is at your doorstep. We offer comfort and convenience at competitive prices, whether you are here as a Winter Texan, looking for a Home Base to explore the Texas Coastal Bend, or residing with us for an Extended Stay. For our fishermen, we offer a fishing pier with an underwater green light, a bait stand and a small marina. Enjoy easy walking to popular restaurants, shopping, Wal-Mart, HEB and more from our convenient location. All facilities are located close to Aransas Bay, Rockport/Fulton Beach Park. Along with the aquatic and skate park, you can enjoy activities such as Birding, Sailing, Kayaking, Beach Combing, and Dolphin watching. Come stay with us for the winter, the summer, a day, or a long weekend! EZ Livin RV Park has Large Spacious off Water Sites, Coastal Oak Trees, and a catch & release fishing pond. This park is located off of Hwy 3036. See map below. Seascapes Cottages are Fully Furnished Kitchenettes 2 bedroom 1 bath available for daily, weekly, or monthly rentals. Plus Furnished Efficiency and unfurnished 2 BR 1 BA home. We are within easy walking distance to popular restaurants, shopping, and entertainment. The Rockport Health and Fitness Center is only two blocks away and offers special discounts for Winter Texans. We are only minutes away from Texas’s first blue wave beach. 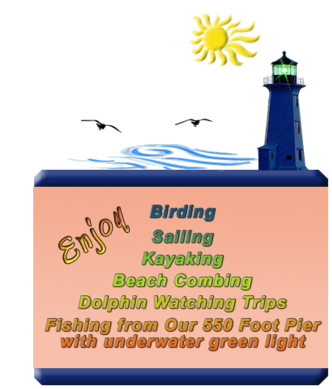 Beacon RV Park and Marina is located on The Great Texas Coastal Birding Trail in Rockport, TX, a city renowned as a top 10 retirement community. Rockport-Fulton is nestled inside Aransas Bay less than an hour away from the Corpus Christi metro area. Bordered by Fulton to the North, Rockport is located in a sheltered bay area famous for fine saltwater fishing and hunting. Rockport, Texas named one of the “Top Ten Art Colonies” in the United States. Beacon RV Park has its own bait stand and a 500 foot fishing pier with green underwater lights for your immediate fishing enjoyment. Please fill out the form to reserve your space. The manager will call to you to confirm your reservation. A non-refundable deposit will be required at confirmation. Please fill out form to request a booking or for more information. I consent to Beacon RV Park & Marina collecting my details through this form.